Goldstone is glass that contains myriad of tiny angular crystals of copper. First made in Italy, goldstone forms by reduction of particles of copper oxide within the glass during a process called annealing. Nothing in nature looks quite like glittering goldstone. Made in three distinct colors (blue, green and orange), goldstone is a tough and durable material that can be made in large pieces and fashioned into slices and objects of almost any desired size and configuration. 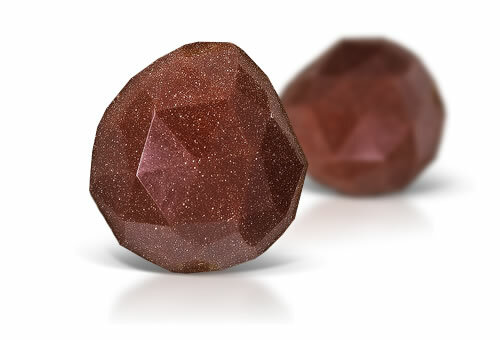 The adventurescence in goldstone glass is produced by numerous brownish triangular or hexagonal copper platelets. Glass stones often have gas bubbles, flow lines and they might show cavities on the surface.